Avg. Group Discount of 5.4%! Gaslamp Quarter, PETCO Park, East Village, Seaport Village, USS Midway, Horton Plaza, Marine Corp Recruit Depot, Balboa Park, San Diego Zoo, Old Town San Diego, Coronado Island, San Diego beaches, Sea World San Diego, Cabrillo National Monument, Qualcomm Stadium. Also close to local wedding/event venues in Gaslamp Quarter, East Village and Downtown San Diego. "The Most Accommodating Hotel Ever!" I stayed here the night before my wedding and my husband and I both stayed the night we got married. This is the most accommodating hotel have ever stayed at in my life. Every single person went out of their way to make sure we had everything we needed and had an amazing stay. We can't wait to stay again! 08-Apr-2018 Verified Review, stayed from Tue Apr 03 to Fri Apr 06 2018 at a $174.00 group rate (3% discount). Opened July 2009, Hotel Indigo is San Diego's first and ONLY green LEED (Leadership in Energy and Environmental Design) Certified hotel. This 12-story hotel is located in the East Village. An upscale residential neighborhood of the Gaslamp Quarter in Downtown San Diego. Walking distance to San Diego's exciting dining, shopping and entertainment district, one block from Petco Park, home of the San Diego Padres and less than a mile from the Convention Center.Hotel Indigo San Diego Gaslamp Quarter is designed for style-conscious travelers and groups who yearn for more than a beige box. Hotel Indigo is known for exceeding guests' expectations by providing excellent service and an unbelievably friendly staff. Guests enjoy on-site full service restaurant, Table 509 Bar and Kitchen, features locally sourced and seasonal Californian fare. 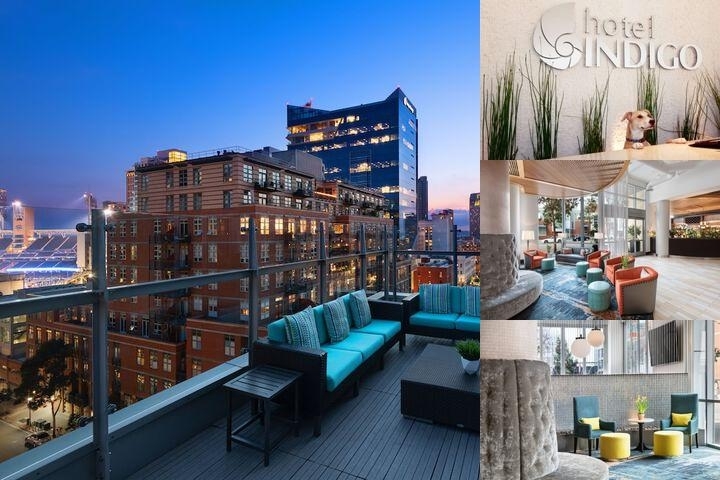 As well as the 9th Floor Bar Terrace Lounge: Level 9 Terrace which features a full bar, fire pits and views of Downtown San Diego, Petco Park and the San Diego Bay.100% non-smoking hotel. Pet-friendly. Hotel does not have a pool. Breakfast is available for guests at the Table 509 Restaurant from 6:00AM - 11:00AM starting at $9.50 per person. Complimentary internet access in guestrooms and meeting space. 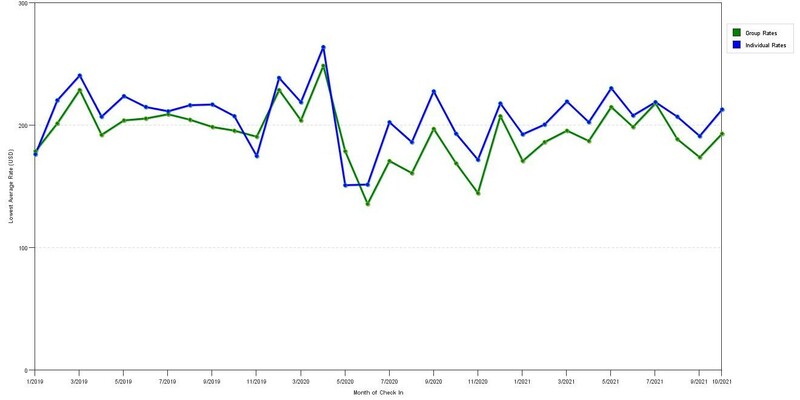 The graph above is fluctuations of room rates for both our group quotes and the lowest online individual prices our system could find at the time the group bid was entered. The best group or meeting displayed is 18.7% in the month of November 2017 and the highest average individual rate is $239 in the month of November 2017. This chart will show past seasonality and also project future months. If you are flexible with dates, you may want to consider staying at Hotel Indigo San Diego Gaslamp in a month when rates are lower. 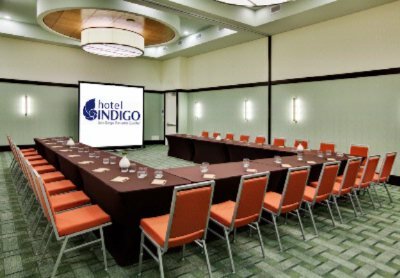 Below are the meeting, banquet, conference and event spaces at Hotel Indigo San Diego Gaslamp. Feel free to use the Hotel Indigo San Diego Gaslamp meeting space capacities chart below to help in your event planning. 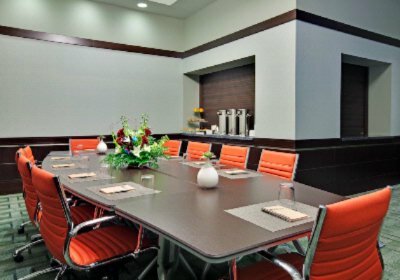 Hotel Planner specializes in San Diego event planning for sleeping rooms and meeting space for corporate events, weddings, parties, conventions, negotiated rates and trade shows. 25 x 40 x 18 Ft.
25 x 25 x 20 Ft.
27 x 28 x 14 Ft.
40 x 20 x 18 Ft.
29 x 32 x 10 Ft.
26 x 12 x 10 Ft.